Powers/Abilities: Giant wore a harness created by the god Zeus that enabled him to assume a form in which he possessed superhuman strength and could increase his size for brief periods of time to become even stronger. He could also create an electrical force field around himself and healed rapidly. The downside was his mortal body couldnt handle so much power, and if he remained in Giant form for too long he would die from the strain. History: A demon of malice took control of the goddess Persephone in ancient times and steered her toward stealing the immortality of the rest of the Greek gods. To stop her, Zeus created a harness imbued with a portion of his power (and according to some material ,the soul of his stillborn son Gaius, although its possible that Flare only dreamed that), which was buried with Persephone (calling herself Malice) when she was confined by the gods, alive but inert, in a tomb in Egypt. In the early 20th century Melissa DArque and her lover William Johnson excavated the tomb, and the desiccated Malice transferred her soul to Melissa, while Johnson found and discovered the powers of the harness, which he used to become a Golden Age hero. Eventually Johnsons daughter, Joyce, married James Jensen who learned who her father was and persuaded her to let him use the harness to become a hero as well, although he eventually retired to raise his family. James was recalled by the Champions to help them battle an occult organization called Demon, and he died in battle with its leader. When the Champions battled Malice and her revived Greek pantheon, Icestar and Rose used Giants harness on the new Ares to change him into Giant. After the battle, Giant stayed in Olympus, his purpose fulfilled. Comments: Jamess adolescent son Billy discovered the harness and learned that he could become Giant without it. 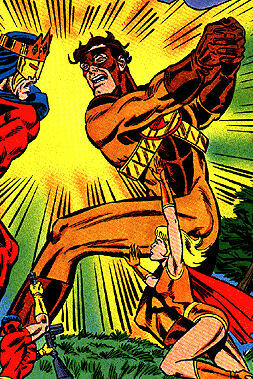 As Goliath, Giant was a member of the Guardians in the original Champions role-playing game.